Where is the largest known collection of theropod skeletons in the world? The largest mass accumulation of theropod skeletons in the world was found at the Ghost Ranch quarry in northwestern New Mexico. In 1947, George Whitaker and Edwin Harris Colbert (1905–2001), members of an expedition from the American Museum of Natural History, found over 100 skeletons of the Late Triassic period dinosaur Coelophysis. 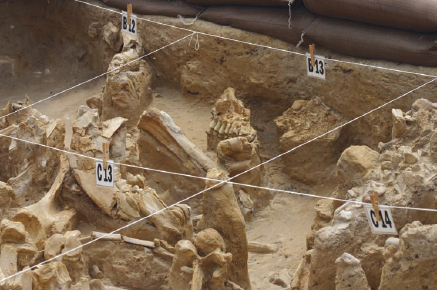 They found the dinosaur skeletons in Arroyo Seco (“Dry Canyon”) on the lands of the Ghost Ranch. The skulls in this bone bed show considerable variations in size, ranging from 3 to 10 inches (8 to 26 centimeters) in length, indicating the presence of both juveniles and adults. In 1948, during further excavations, George Whitaker and Carl Sorenson discovered two skeletons of Coelophysis with juveniles inside the stomach areas. This was thought to indicate that this species was cannibalistic. It is still a mystery why so many of these animals ended up in such a small area. Some paleontologists suggest that a herd of Coelophysis was overwhelmed by a flood, perhaps while crossing a river. If this is true, then this discovery is the first evidence for herding behavior among a dinosaur species. There are a number of sites aroudn the world considered to be “fossil parks,” places rich in large collections of dinosaur fossils (iStock).